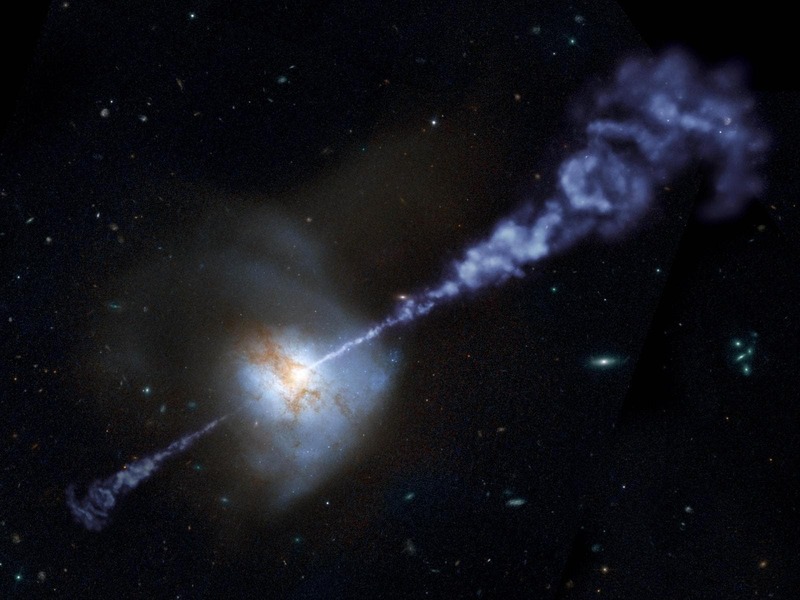 They are nature's very own Death Star beams – ultra-powerful jets of energy that shoot out from the vicinity of black holes like deadly rays from the Star Wars super-weapon. Now a team of scientists led by the University of Southampton has moved a step closer to understanding these mysterious cosmic phenomena – known as relativistic jets – by measuring how quickly they 'switch on' and start shining brightly once they are launched. How these jets form is still a puzzle. One theory suggests that they develop within the 'accretion disc' – the matter sucked into the orbit of a growing black hole. Extreme gravity within the disc twists and stretches magnetic fields, squeezing hot, magnetized disc material called plasma until it erupts in the form of oppositely directed magnetic pillars along the black hole's rotational axis. In a new study published today [Monday, 30 October] in Nature Astronomy, an international team of scientists led by Poshak Gandhi show how they used precise multi-wavelength observations of a binary system called V404 Cygni – consisting of a star and a black hole closely orbiting each other, with the black hole feeding off matter from the star that falls through the disc – to throw light on this hotly debated phenomenon. V404 Cygni is located about 7,800 light years away in the constellation of Cygnus, and weighs as much as about nine of our Suns put together. Dr Gandhi and his collaborators captured the data in June 2015, when V404 Cygni was observed radiating one of the brightest 'outbursts' of light from a black hole ever seen – bright enough to be visible to small telescopes used by amateur astronomers, and energetic enough to tear apart an Earth-like planet if properly focused. This 'blink of an eye' delay was calculated to represent a maximum distance of 19,000 miles (30,000 km), impossible to resolve at the distance of V404 with any current telescope. Dr Gandhi, of the University of Southampton, said: "Scientists have been observing jets for decades, but are far from understanding how nature creates these mind-bogglingly vast and energetic structures. "Now, for the first time, we have captured the time delay between the appearance of X-rays and the appearance of optical light in a stellar-mass black hole at the moment jet plasma is activated. This lays to rest the controversy regarding the origin of the optical flashes, and also gives us a critical distance over which jet plasma must have been strongly accelerated to speeds approaching that of light." In Star Wars terms, the key measurement of this study can roughly be likened to measuring the distance between the surface of the Death Star, where multiple rays of light shoot out, and the point where they converge into a single bright beam. "But the physics of black hole jets has nothing to do with lasers or the fictional Kyber crystals that power the Death Star. Nature has found other ways to power jets," said Dr Gandhi. "Gravity and magnetic fields play the key roles here, and this is the mechanism we are trying to unravel." The study also creates a link between V404 Cygni and supermassive black holes, which lie at the centre of massive galaxies and which weigh billions of times more than stellar-mass black holes. Similar jet physics may apply to all black holes. Dr Gandhi said: "This is an exciting and important discovery which can be fed back into theory about relativistic jets, and contributes to our ever-growing understanding of black holes." The X-ray emission, representing the accretion disc 'feeding' the jet at its base, was captured from Earth orbit by NASA's NuSTAR telescope, while the moment the jet became visible as optical light was caught by the ULTRACAM high-speed camera, mounted on the William Herschel Telescope on La Palma, in the Canary Islands. Professor Vik Dhillon, of the University of Sheffield, the principal investigator behind ULTRACAM, commented: "This discovery was made possible thanks to our camera gathering 28 frames per second. It demonstrates the untapped potential of studying astrophysical phenomena at high speeds." At the same time, radio waves from the extended portions of the jet plasma were observed by a team of Professor Rob Fender, of the University of Oxford, using the AMI-LA radio telescope, in Cambridge, UK. Professor Fender said: "These observations are another major step towards understanding exactly how relativistic jets are formed by black holes. Radio detections come from the outer jet and are the key unambiguous indicator of ongoing jet activity. The optical, X-rays and radio were also crucial for that discovery."